If you've got busy schedule and need your laundry sooner, use Push & Wash. Just push a button, and the Indesit BWA 81283X W Washing Machine automatically starts a 50-minute wash at 30°. An Anti-odour cycle gets rid of more persistent smells by adding a rinse at the end of a cycle, then maintaining a constant temperature and agitating the drum in a certain way to keep clothes fresher. For active households, the Sports cycle is a handy option. Clean different sportswear fabrics thoroughly, from nylon mix to heavy cotton. Get your dirty trainers looking great using the Sport Shoes programme. 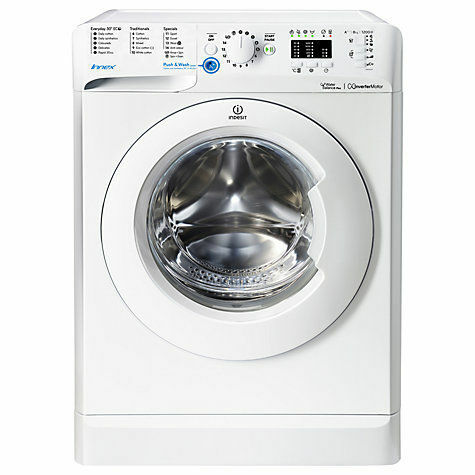 The BWA 812 83X Washing Machine provides 16 different wash cycles to properly care for your clothes. Handle any laundry situation from light soiling to heavy stains. Avoid leaving wet laundry in the washing machine overnight or while you're at work with the delay timer. It also lets you wash at night when energy rates are lower. Program it to start up to nine hours in advance so that your washing is complete when you wake up or get home. It's ideal if you can't find the right time to get your laundry done.